In an effort to return my morning blood sugar levels (also known as “fasting blood sugar”) to normal range for a Type 1 Diabetic, I am going through the elimination period of the Autoimmune Protocol. This post outlines why I am doing the Autoimmune Protocol along with my plan of attack. 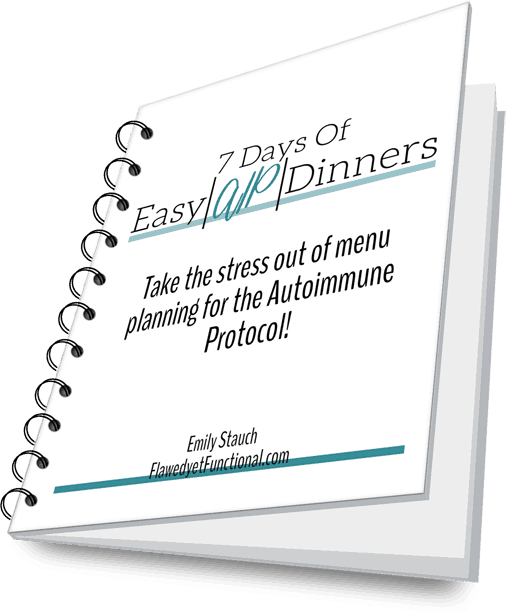 If you are looking for answers to your autoimmune disease, you’ve come to the right place! There is hope and healing in food (without negative side effects!). Read on to see how Week 1 of the Autoimmune Protocol went for me. 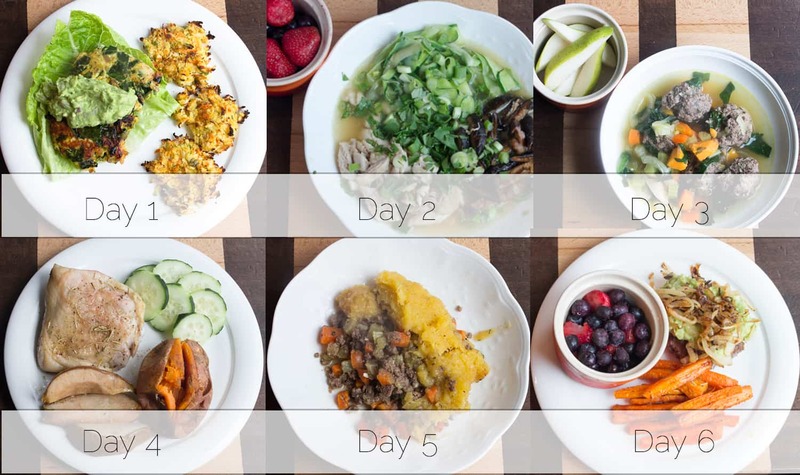 Week 1 of the Autoimmune Protocol (AIP) elimination diet is complete! I must say this round of AIP has been much easier than when I attempted it in October. The difference this time is I’ve found many more resources for tasty AIP recipes. I know this might sound snobbish, but I just can’t tolerate bland food. Many hours of my day are spent in the kitchen, and it is deflating for me to put so much time and effort into a meal only to have it taste boring and lackluster. 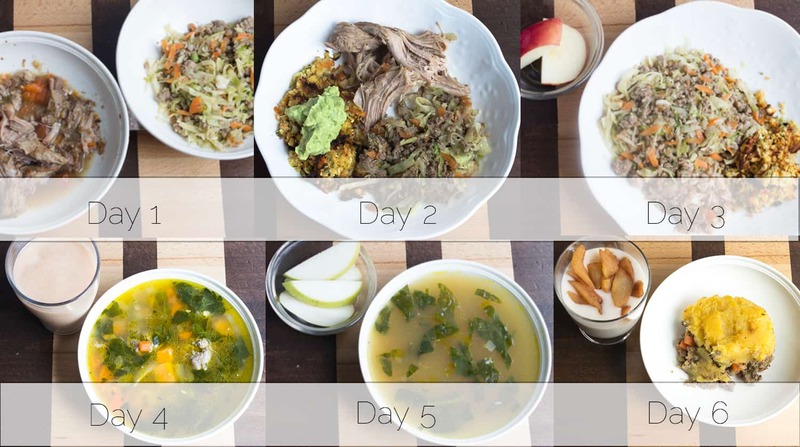 I have shared all the meals I made this week along with the stand-outs below. Some recipes I tried were absolutely fantastic, and I will be making them again soon! Here are a couple blogs that have helped me get through this week with ease. In this review each week, I will review the food I ate, how my blood sugar fared, how I felt this past week, and my goals for the next week. With that being said, let’s dive into the food. It’s all about the food, isn’t it? Breakfast was the meal I was least confident in my ability to provide nutritious, delicious meals that my whole family would enjoy. My main concern? Not eating eggs. Eggs are out for the 30 day elimination period of the autoimmune protocol. My youngest still shouts out every morning as he comes down the stairs, “Mommy, are you making EGGS?! ?” Emphasis is real, he loves his eggs. However, he is surviving without his eggs though, as are the rest of us. To be honest, I am not just surviving. I’m thriving. I know that’s cliche to say, but it’s true. These breakfasts fill me up, give me energy to hop up from the table and attack my day, and keep me full until lunch. There’s no mid-morning crash, no cravings around 11am, and no bloat. I am fueled, energized, and ready for the day after eating this diet. The recipes made each day are below the picture (If you’d like more ideas, check out my AIP board on Pinterest). You will see I planned for leftovers, and I believe this is necessary for success in this diet. The time in the kitchen is quite a bit more than the typical American is used to. In order to maximize that time and minimize the time in the kitchen other days, plan and use leftovers. Day 2 – Breakfast Hash Casserole with Butternut Squash and Cilantro – I took liberties with this one. I cubed the squash instead of shredding it, and I added cubed ham at the end, just putting it in the pan long enough to warm it up. As you can see, I ate well! Both my husband and I were more satisfied after each meal than we were the first time we tried the elimination diet. I don’t know the exact reason for this possibly more fat or just flavors we enjoy. From further reading, I know we were lacking fish and organ meat in our diet. I will try to include that next week. The organ meat will be a first for me! Roasted Chicken with Pears and Rosemary – absolutely delicious! I will make this again even when finished with the elimination diet. Tapioca Pudding – This was a winner for me, but I love pudding and pudding texture more than my family. It did raise my blood sugar quite a bit too, so I won’t be having it often! Chicken, Apple, Bacon, Sweet Potato, and Brussels Sprouts Skillet – I made this with ground turkey because I couldn’t find ground chicken, but it was still so flavorful and filling! I’ll be making it again! If you’ve been following along on Instagram, you’ve seen my blood glucose readings every day. They have been really good for a type 1 diabetic, especially one not using insulin! My blood sugar is definitely lower overall and far less volatile. Being the numbers nerd that I am (I was an actuarial analyst in my past life! ), I wanted to put a graph to the numbers. The squiggly lines show the fluctuation of my blood glucose readings throughout the day. The red line is the week before I started the AIP diet, i.e. the Control Week (although I had already cut out coffee and alcohol during this week). The blue squiggly line is my blood glucose readings after I started the AIP diet. Notice that the red line has higher peaks. The blue line doesn’t go above 150 (that’s a major win!). Now data with that much variation is hard to draw conclusions from, so I drew a trend line (exponential, for those interested, I don’t expect you do be!) so I could see the general direction of the data. The light red, straight line is the trend line for the control week, and the light blue, straight line is the trend line for AIP Week 1. The blue line is lower overall from the red line, and it is headed down whereas the light red line is trending up. 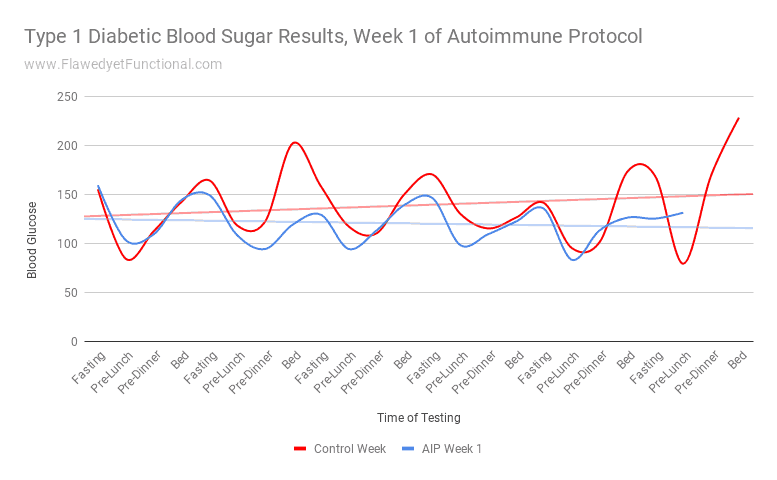 Conclusion: The Autoimmune Protocol diet is not only lowering my average blood sugar level, it is causing my blood sugar to me more stable. Major win. I’m excited to see what the following weeks have in store! If any of you out there are skeptical of the impact that changing your diet could have on your long-term health, daily productivity, and general feeling of well being in your body, you are not alone. I was there once too. I was a total skeptic of the role of gluten in our bodies (the negative role, mind you, in everyone’s body.) For example, I thought it was totally ridiculous that my church started only serving Cherrios as snack in the children’s classes to eliminate allergens from the classroom (And now, one year later, I don’t even want my kids to eat Cherrios at all!). What I thought was true has been totally turned on its head. Diet is infinitely important, and you can heal your body through food! Beyond the role of food, I was also skeptical that I would feel different when eating a Paleo/AIP diet. I thought I had plenty of energy to complete my day, but now, I have endless energy. I don’t have a problem completing household chores in the afternoon or evening. Prior to my first elimination diet, if I didn’t get my cleaning, laundry, or projects done before noon, they weren’t getting done at all. I just didn’t have the energy or desire to keep working after lunch. All that has changed. I have energy to clean the bathrooms during nap time, energy to prep vegetables for breakfast the next day after the kids go to bed, and energy to fold laundry after dinner. I have so. much. energy. My desire to keep going throughout the day has changed too. While I don’t always jump for joy to wash the dishes, I can talk myself into it easily. I have the energy, it really is quick, why not? So how did I feel during Week 1? I’ve had energy to not only cook more fresh meals with more vegetables, but I’ve kept up on my other responsibilities. If this had happened a year ago, the laundry would be undone, house filthy, and I might have skipped commitments to try to catch-up. For Week 2, I plan to eat some fish and organ meat. I have learned to like fish as an adult, but I have never bought, prepared, or eaten organ meat. This will be a learning experience for me! Otherwise, Week 2 is planned to be much of the same as Week 1. I hope not to get sick this week so that my sleep schedule stays on track, but really, I only slept in on Day 5. I was still on routine the rest of the days. 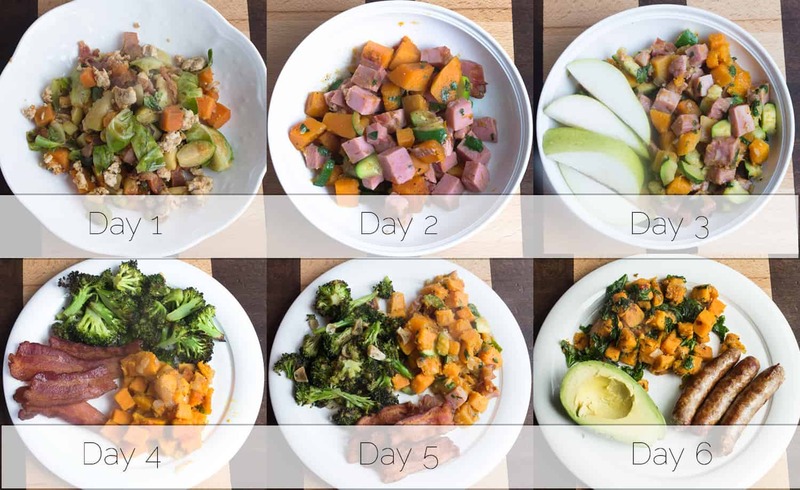 That wraps Week 1 of the Autoimmune Protocol Elimination Diet! Finding good recipes that will satisfy you is key to success on the diet! The results after only one week are (1) lower, more stable blood sugar and (2) endless energy. Those are pretty fantastic results! Check out Instagram to see how my progress goes each day! Anyone else doing hard things out there? Is your interest piqued to heal your body with food? Do you have any questions or topics you’d like me to cover? Comment below or send me a note!